Instead of framing a parterre with boxwood (Buxus) hedges, how about using feather reed grass (Calamagrostis) instead? Unlike box, it will change through the season. Don’t you love how the soft foliage here allows these bulbs to shine? Grasses have been the big thing recently. 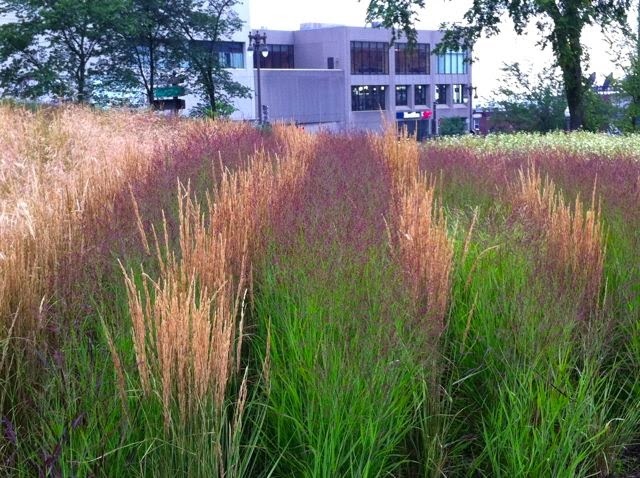 I’m not talking about puny little turf grasses, but statuesque babes like maiden grass (Miscanthus), switch grass (Panicum), or feather reed grass (Calamagrostis). 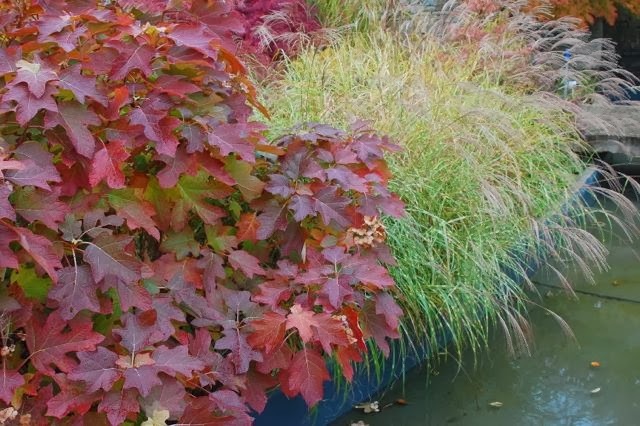 Garden designers such as Piet Oudolf (who worked with Toronto landscape architect Martin Wade on the Toronto Botanical Garden’s entry garden) have been influential in this. 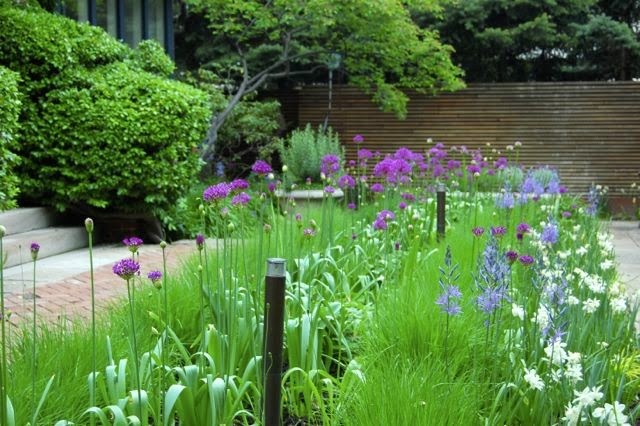 But between Oudolf’s use of grasses as a matrix embedded with specimen plants or grand grasses rising in individual tufts in gardens around town, where do you go for ideas? Here are a few. I’d love to hear others from you. We’re accustomed to seeing grass as a groundcover. We call it a lawn. But I like these alternating stripes of densely planted golden Calamagrostis and Panicum, with its airy, red seed heads. This fills a large lot in downtown Québec City. For a grass, or grasslike plant, on a medium scale, I’m enamoured of this bronze-coloured sedge (Carex buchananii) as planter material. I’m also fond of pronouncing its species name buch-an-an-ee-eye. Try it. It’s fun. 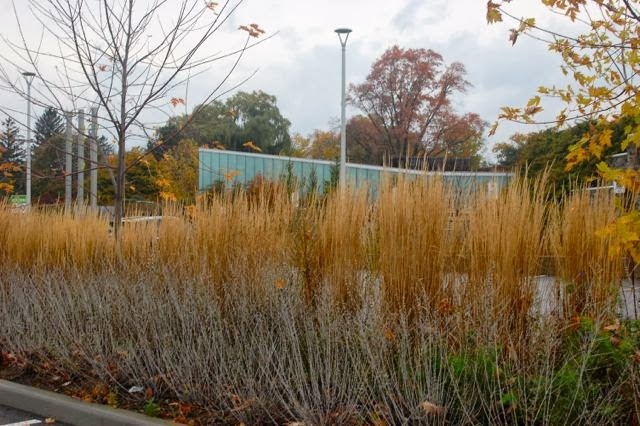 The new parking lot at the Toronto Botanical Garden makes extensive use of tall grasses as screening. This would be effective as a garden hedge, too. And, again, unlike most traditional hedging, its look would evolve. Of course, that could be the down-side, too – you’d have to cut it down in spring and wait for it to regrow. 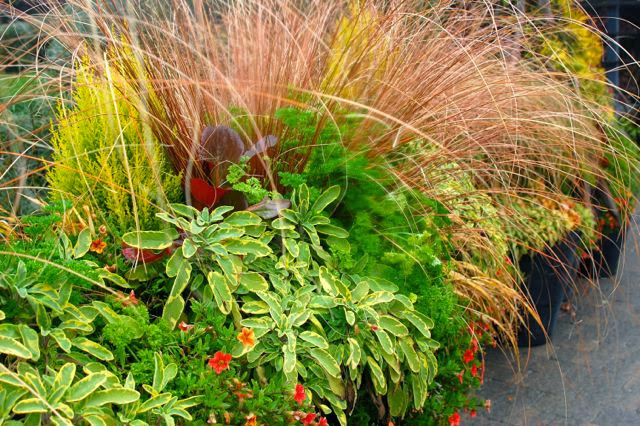 Grass can, of course, simply be an accent in your garden. The airiness of this striped Miscanthus sinensis contrasts beautifully with the coarse texture of the oakleaf hydrangea (Hydrangea quercifolia). Note that the clump is huge, nicely scaled with the shrub beside it. A stingy planting wouldn’t do. I like the idea of uses grasses as a hedging in a formal garden. Not as permanent for sure, but it can have it's place in formal design. My AWOL Cat Came Back!